This article is about the Australian regiment. For the British Army, see Special Air Service. For the New Zealand Army, see New Zealand Special Air Service. The Special Air Service Regiment, officially abbreviated SASR though commonly known as the SAS, is a special forces unit of the Australian Army. Formed in 1957, it was originally modelled on the British SAS sharing the motto, "Who Dares Wins". The regiment is based at Campbell Barracks, in Swanbourne, a suburb of Perth, Western Australia, and is a direct command unit of the Special Operations Command. It has taken part in operations in Borneo, Vietnam, Somalia, East Timor, Iraq and Afghanistan, as well as many other peacekeeping missions. The SASR also provides a counter-terrorist capability, and has been involved in a number of domestic security operations. A direct command unit of Special Operations Command, the Special Air Service Regiment (SASR) is a special forces unit of the Australian Army and "is tasked to provide special-operations capabilities in support of the Australian Defence Force. This includes providing unique capabilities to support sensitive strategic operations, special recovery operations, advisory and training assistance, special reconnaissance, precision strike and direct action". The SASR is primarily structured to conduct covert long-range reconnaissance and surveillance in small teams in enemy-controlled territory, while commando units are utilised to conduct raids in larger groups. In addition to warfighting during conventional conflicts, the regiment is also tasked with maintaining a specialist counter-terrorist capability. Other capabilities include training local or indigenous forces, recovery of Australian citizens and humanitarian assistance. The SASR is also trained in counter-insurgency operations. In the long-range reconnaissance role, the SASR typically operates in small patrols of between five and six operators with the task of infiltrating enemy-held territory and providing intelligence on enemy activities and capabilities. During such tasks the SASR seeks to evade rather than confront the enemy. SASR soldiers also direct fire support including air strikes to destroy enemy installations and disrupt or kill enemy forces whenever possible. SASR reconnaissance patrols can be inserted by air (either by helicopter, standard parachute or HALO), land (on foot or by vehicle) or sea (including by submarine, small boats, canoes or closed-circuit breathing apparatus) and have proven capable of covering large distances and staying concealed in jungle, desert and mountain terrain. SASR patrols may also conduct sabotage and short-duration raids on high-value targets, including headquarters, airfields and communications nodes. One of the primary roles of the regiment is to provide a counter-terrorist capability, with an element of the SASR designated as the Tactical Assault Group (West) to respond to domestic incidents on the west coast of Australia and also for international operations. TAG (West) maintains a short-notice capability to conduct military operations beyond the scope of state/territory and federal Police Tactical Groups. Offensive counter-terrorist operations may include direct action and hostage recovery. A capability to board ships whilst underway and off-shore oil platforms is also maintained. TAG (West) is kept at high readiness for a period of 12 months, before being replaced by another squadron in this role. The 2nd Commando Regiment provides Tactical Assault Group (East) to respond to domestic incidents on the east coast of Australia. The SASR draws on the experiences of Z Special Unit, M Special Unit, the Independent Companies and the Coastwatchers which operated in the South West Pacific Area against the Japanese during World War II. These units had been disbanded soon after the war as part of the demobilisation of the Australian military; however, after observing the operations of the British Special Air Service during the Malayan Emergency in the 1950s the Australian Army decided to raise its own SAS unit. The 1st Special Air Service Company was established on 25 July 1957 at Swanbourne, a suburb of Perth, Western Australia, with a strength of 16 officers and 144 other ranks. In 1960, the company became part of the Royal Australian Regiment (RAR) and was given the responsibility for commando and special forces operations. As part of the pentropic organisation adopted by the Australian Army at the time, the regiment's primary wartime role was divisional-level reconnaissance. On 20 August 1964, the SAS gained regimental status and was expanded to two sabre squadrons and a headquarters, severing the link with the RAR. The raising of a third squadron was approved on 30 April 1965 as part of an overall expansion of the Australian Army. The SASR first saw action in 1965 as part of the British Commonwealth force stationed in north Borneo during the Indonesian Confrontation. The SASR troopers operated alongside their British and New Zealand counterparts in operations aimed at stopping Indonesian infiltration into Malaysia, taking part in Operation Claret. 1 Squadron conducted reconnaissance patrols in Sarawak from February to July 1965, and cross-border operations between May and July. They suffered their first fatality on 2 June when a soldier was gored by an elephant. 1 Squadron completed operations on 1 August and returned to Australia. 2 Squadron arrived in Borneo in January 1966 for a four-month deployment, and despite the suspension of Claret operations it also conducted reconnaissance patrols and cross-border operations, undertaking a total of 45 patrols on both sides of the border. On 19 March two soldiers drowned during a river crossing. On 21 July, 2 Squadron was relieved by a British SAS squadron and returned to Australia in August. Despite often being deployed in the reconnaissance role, the SASR killed at least 20 Indonesian soldiers in a series of ambushes and contacts. Three SASR soldiers were killed. These operations mostly occurred in secret, and were never admitted during the war. An SASR patrol during Operation Coburg, South Vietnam 1968. A fourth squadron was raised in mid-1966, but was later disbanded in April 1967. The SASR operated closely with the New Zealand SAS, with a troop being attached to each Australian squadron from late 1968. Completing its final tour in October 1971, 2 Squadron was disbanded on return to Australia, with Training Squadron raised in its place. During its time in Vietnam the SASR proved highly successful, with members of the regiment known to the Viet Cong as Ma Rung or "phantoms of the jungle" due to their stealth. In a six-year period the Australian and New Zealand SAS in Vietnam conducted nearly 1,200 patrols and inflicted heavy casualties on the Viet Cong, including 492 killed, 106 possibly killed, 47 wounded, 10 possibly wounded and 11 prisoners captured. Their own losses totalled one killed in action, one died of wounds, three accidentally killed, one missing and one death from illness. Twenty-eight men were wounded. During the period of its deployment 580 men served in the SASR in Vietnam. The remains of the last Australian soldier who went missing in action in 1969 after falling into the jungle during a suspended rope extraction were found in August 2008. Australian SASR personnel also worked with US Army Special Forces in Vietnam, and provided instructors to the MACV Recondo School, and then to the LRRP Training Wing at the AATTV-operated Van Kiep Training Centre from 1967. Some members of the regiment also served with MACV-SOG units, with soldiers often serving on exchange with American Special Forces. The Australian withdrawal from Vietnam brought to an end the doctrine of 'forward defence' through involvement in Southeast Asian wars. Instead, the Australian military's new focus was on the defence of continental Australia against external attack. In line with this change, the SASR took the lead in developing the Australian Army's capability to conduct patrol operations in Northern Australia. It was later recognised that this role required dedicated units with the Army forming three Regional Force Surveillance Units in the early 1980s trained by the SASR. In July 1977 two SASR patrols were deployed to north Irian Jaya with the approval of Indonesian authorities to provide first aid to the survivors of an RAAF Iroquois helicopter which had crashed in the remote jungle during survey operations, and to secure the wreckage from possibly being captured by members of the OPM independence movement. During this time the SASR also continued to train overseas with other special forces units. On one such exercise in the Philippines, a US special forces C-130 Hercules crashed into the South China Sea shortly after take-off from Subic Bay on 26 February 1981, killing 23 passengers including three Australians from the SASR, as well as a number of Americans, Filipinos, and New Zealanders. Meanwhile, following the Sydney Hilton bombing in February 1978, the SASR was given responsibility for providing Australia's military counter-terrorism response force, for which 2 Squadron was raised again in 1982. In addition to being able to respond to terrorist attacks in Australian cities, the SASR counter-terrorism unit was required to develop a capability to board ships underway and off-shore oil platforms. In May 1987 a squadron from the SASR was alerted for a possible deployment to Fiji as part of Operation Morris Dance, but did not leave Australia. The regiment was not involved in operations during the Gulf War in 1991 although two troops were again placed on standby for deployment at short notice, while other elements remained on high alert to respond to a terrorist incident in Australia if required. The first SASR units to deploy on active service after the Vietnam War did so as part of Australian peacekeeping deployments. Small numbers of SASR personnel were involved in Operation Habitat in Turkey and Northern Iraq as medics to assist Kurdish refugees between May and June 1991. Personnel were also provided by the regiment as part of the Australian contribution to the UN Special Commission established to oversee the destruction of Iraq's weapons of mass destruction between 1991 and 2000. SASR medics deployed with some of the weapons inspection teams, and at times were also employed as drivers and for "personal protection" tasks. Several SASR signallers from 152 Signal Squadron also deployed to the Western Sahara between September 1991 and May 1994 as part of the Australian contingent there. Contrary to some reports, the SASR did not provide a security team for service in Cambodia although some SASR-qualified signals sergeants from 152 Signal Squadron were deployed as part of the Australian military contribution to the United Nations Advance Mission in Cambodia (UNAMIC) and Force Communications Unit between 1991 and 1993. A small number of members of the regiment served on exchange with the British SAS and Special Boat Service (SBS) in Bosnia in the early 1990s, including a sergeant who commanded an SBS detachment in April 1993. In April 1994, a 10-man SASR team from J Troop was attached to Australian forces in Somalia to provide an elite response, VIP protection and force protection to the Australian Service Contingent in Mogadishu. Known as "the Gerbils", the small team operated from Toyota Landcruisers and Datsun utility vehicles and two M-113 APCs. They were subsequently involved in a number of actions, including an incident on 21 May when they were flown to the scene of a downed Canadian civilian helicopter 20 kilometres (12 mi) north of Mogadishu to protect the crew, and another on 16 August when they were involved in a skirmish during a convoy which resulted in two Somalis being killed after one of them aimed an AK-47 at the Australians. They returned to Australia in November 1994. SASR-qualified medical sergeants were also deployed as part of the contribution to the United Nations Assistance Mission for Rwanda, some of whom were present during the Kibeho Massacre in April 1995, for which one SASR soldier and two other Australians were awarded the Medal of Gallantry for their actions. In addition, individual members of the SASR have been attached to a wide range of Australian peacekeeping deployments as observers, including in Kashmir, Lebanon and in the Sinai. Deaths during training accidents make up the majority of the SASR's fatalities. The worst accident in the regiment's history occurred on the evening of 12 June 1996 when two S-70-A9 Black Hawk helicopters from the 5th Aviation Regiment carrying SASR troopers collided during a live-fire counter-terrorism/special-recovery operation exercise at Fire Support Base Barbara in the High Range Training Area near Townsville, Queensland. This activity was part of Exercise Day Rotor 96 and took place on the second day of the exercise, sometime after 18:30, requiring the pilots to use night vision goggles. Six aircraft had been approaching the target area when, 30 seconds from the landing zone, one of the helicopters veered to the right, clipping the tail rotor of another helicopter. One Black Hawk crashed immediately killing 12 personnel on board, while the other was able to make a crash landing but burst into flames, killing six. Crash survivors, soldiers from the other helicopters and exercise staff risked the flames and exploding ammunition to rescue their comrades and retrieve the bodies of the dead. Fifteen members of the SASR and three from the 5th Aviation Regiment lost their lives in the accident. Fourteen personnel were later officially recognised for their part in the rescue and evacuation operation. In July 1997 an eight-man SASR team deployed at short notice to Butterworth in Malaysia to provide close protection and communications to the Australian ambassador and embassy staff in Cambodia if required, in preparation for the evacuation of Australian nationals in the wake of civil unrest which occurred following a coup in that country. The evacuation operation was subsequently completed successfully, with RAAF C-130s supported by Airfield Defence Guards and other military personnel evacuating 455 Australians and other nationals from Cambodia as part of Operation Vista. Later, following the agreement of a truce in October 1997 which ended the conflict in Bougainville, Australian personnel were deployed as part of the New Zealand-led Truce Monitoring Group, with an SASR officer being included in the reconnaissance party and later serving on its headquarters. In April 1998, Australia took over leadership of the mission, which was renamed the Peace Monitoring Group. Numerous SASR personnel served in Bougainville over a four-year period as part of Operation Bel Isi, both in headquarters positions and as part of the monitoring teams. In 1998, the SASR made its first squadron-strength deployment since Vietnam when 1 Squadron, with an attached New Zealand SAS troop, was deployed to Kuwait in February as part of the American-led Operation Desert Thunder. The force, known as Anzac Special Operations Force (ANZAC SOF), was fully integrated, with the New Zealanders providing the squadron's third troop. While the crisis was resolved peacefully, if military action had been taken the SASR would have been used in the Combat Search and Rescue (CSAR) role to recover aircrew shot down by Iraqi air defences. The force returned to Australia in June 1998. Regardless, the operation represented the first time that SASR tactical headquarters had been deployed outside of Australia. The SASR played a key role in the Australian-led international peacekeeping force (INTERFET) in East Timor between September 1999 and February 2000. In the days prior to the commencement of INTERFET, the SASR was involved in the RAAF evacuation of United Nations Mission in East Timor (UNAMET) staff, Australians and refugees from East Timor following increasing violence by Indonesian military-backed militia after the East Timorese voted for independence from Indonesia. [Note 2] The SASR subsequently provided the initial INTERFET forces to secure the point of entry at the airport and seaport in Dili. 3 Squadron, along with Allied Special Forces elements from the NZ SAS and British SBS, formed INTERFET's special forces element, known as Response Force (RESPFOR). The SASR spearheaded most operations conducted by the international force during the early days of the intervention in East Timor and, as in Vietnam, served as the eyes and ears of the force, patrolling extensively through militia-controlled areas in vehicles and on foot as INTERFET expanded to take control of the rest of East Timor. It was involved in a number of significant contacts with pro-Indonesian militia, including at Suai on 6 October 1999 during which two SASR soldiers were wounded, and later at Aidabasalala on 16 October 1999. On 22 October 1999, the SASR conducted a combined air insertion in Black Hawk helicopters and an amphibious landing from HMAS Brunei into the Oecusse Enclave to secure the beachhead ahead of an amphibious assault by the main force, after the insertion of Navy Clearance Divers by submarine the previous night to conduct a reconnaissance and survey of the amphibious landing site. It was reported that the SASR also conducted covert patrols in the Enclave before the landings. Other tasks included VIP protection and other special forces tasks as required by the task force commander. 3 Squadron was later awarded a Meritorious Unit Citation on 25 March 2000. 1 Squadron replaced 3 Squadron in December 1999, and completed its tour in February 2000. The regiment formed a key element of the security force in place for the Sydney Olympic Games in 2000, and in the lead-up to the event the regiment underwent a period of modernisation, acquiring new equipment and capabilities, including the ability to respond to chemical, biological and radiological threats, as well as developing techniques for the clandestine boarding of moving ships at night. During the Games two SASR squadrons were available for counter-terrorist operations, with one designated to respond to incidents in Sydney and Canberra, while the other was on standby for incidents elsewhere. The domestic security role increased in prominence after the terrorist attacks in the United States on 11 September 2001, and the SASR has since formed part of the security force for events such as the 2003 Rugby World Cup, 2006 Commonwealth Games, and other international events. The SASR maintains TAG (West) to respond to incidents on the west coast of Australia. 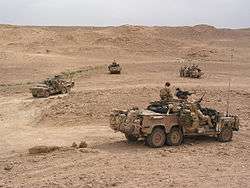 In October 2001, the Australian government announced that it was sending a special forces task group built around an SASR squadron to participate in the campaign against al-Qaeda and the Taliban in Afghanistan designated Operation Slipper. After staging through Kuwait, 1 Squadron arrived in Afghanistan in December 2001 with the other SASR squadrons rotating in at approximately six-monthly intervals. The SASR's main role in Afghanistan was to conduct reconnaissance and surveillance of al-Qaeda and Taliban positions, activities and capabilities. SASR force elements also conducted some offensive operations. After arriving at FOB Rhino, the SASR initially operated in southern Afghanistan with US Marines from Task Force 58, conducting long-range vehicle mounted patrols over several hundred kilometres around Kandahar and into the Helmand Valley near the Iranian-border. On 16 February 2002 Sergeant Andrew Russell was killed when the Long Range Patrol Vehicle (LRPV) he was travelling in hit a land mine during an operation in the Helmand Valley. Two other soldiers were wounded in the incident. Later the SASR operated under command of Task Force 64. The SASR then moved to eastern Afghanistan where it played a key role in Operation Anaconda in March 2002. During the operation SASR teams were to provide on-location, in-depth operational intelligence and reconnaissance after they infiltrated the Shahi-Kot Valley ten days prior to the operation, and also saved the lives of 24 soldiers of the US 75th Ranger Regiment after their helicopter was shot down, by providing sniper overwatch and guiding in precise air strikes to end the enemy advance as they attempted to overrun the isolated Americans. Up to 300 al Qaeda fighters were later estimated to have been killed as a result of the airstrikes they called-in. Two SASR advisory and liaison officers were attached with the US 10th Mountain Division to help plan the division's air assault operations, and were subsequently involved in heavy fighting after the unit they were with became pinned down and took a number of casualties. Supported by heavy close air support they were evacuated by helicopter that evening. Four days into the operation, SASR elements identified a potential escape route for the al-Qaeda leadership. Other coalition special forces had attempted to establish observation posts, but had quickly been discovered by shepherds or villagers. The Australians inserted a patrol undetected to monitor the escape route. From more than 1,200 metres (1,300 yd) high on a mountain, the patrol spotted a group of al-Qaeda figures dressed in Russian camouflage and wearing black balaclavas. They carried more advanced weapons than normal insurgents, and appeared to be guarding a white-robed older man with a cane as they fled the battlefield. US intelligence at first believed it was Osama bin Laden but later revised the identification to his second-in-command, Ayman al-Zawahiri. An airstrike was called in; however, there was later doubt about whether it was successful. Australian forces later uncovered a number of arms caches and destroyed an anti-aircraft piece, while other elements were tasked with screening possible escape routes to the south and killed a number of fighters as they attempted to withdraw. The initial task group was replaced by another squadron in March and April 2002, while a third squadron rotated into Afghanistan in August 2002. The SASR withdrew from Afghanistan in November 2002 after all three sabre squadrons had served in the country. A Special Forces Task Group (SFTG) was deployed to Afghanistan in August or September 2005, operating in the southern province of Uruzgan. The SFTG consisted of elements from the SASR, 4 RAR (Commando), the Incident Response Regiment (IRR) and logistic support personnel. Two CH-47 Chinook helicopters from the 5th Aviation Regiment were deployed to Afghanistan in March 2006 to support the SFTG. A forward operating base was subsequently established at Tarin Kowt. This task group was withdrawn in September 2006, after a year of operations working closely with special forces from the United Kingdom and the Netherlands. During this period the task group was on patrol for 306 days, involved in 139 contacts, and sustained 11 soldiers wounded. The SFTG was replaced by a Reconstruction Taskforce made up of engineers and conventional infantry. A 300-strong Special Operations Task Group (SOTG) was redeployed to Afghanistan to support the Reconstruction Taskforce in April 2007, including an SASR squadron, commando company group, and an integral combat service support team. The commando element was mostly used to conduct direct action tasks, with the SASR returning to conducting strategic reconnaissance. On 16 January 2009, Trooper Mark Donaldson was awarded the Victoria Cross for Australia, the highest award for gallantry in the Australian honours system, for gallant acts performed whilst serving with the SASR in Afghanistan on 2 September 2008 when his patrol was ambushed, resulting in the wounding of nine Australians. In addition to the SASR's contribution to the SOTG, the regiment also provided "Defence Support Teams" to protect Australian Secret Intelligence Service (ASIS) agents in Afghanistan. On 23 January 2011, Corporal Ben Roberts-Smith was awarded the Victoria Cross for single-handedly neutralising two machine-gun positions during an operation in Tizak on 11 June 2010. On 26 March 2013, it was announced that Special Operations Command would receive the Australian Army's first battle honour since the end of the Vietnam War for outstanding performance during the Shah Wali Kot Offensive in Afghanistan from May to June 2010. The battle honour, titled "Eastern Shah Wali Kot", was awarded in recognition of the operational actions of the SASR and 2nd Commando Regiment from the Australian Special Operations Task Group Rotation XII. The SASR has also been collectively awarded the Meritorious Unit Citation and Unit Citation for Gallantry for its actions in Afghanistan. During an operation in April 2013 an SASR corporal cut the right hands from the corpses of three insurgents after being told by a military lawyer that this would be an acceptable way of obtaining fingerprints. After this incident was reported to the senior Australian command at Tarin Kowt the SOTG was withdrawn from operations for a week-long "operational pause". One soldier remained under investigation for this incident in August 2015. The bulk of SOTG was withdrawn from Afghanistan in late 2013 as part of the Australian drawdown, although some special forces remain as part of the small Australian force in the country. SASR casualties in Afghanistan include five soldiers killed in action. The SASR provided the majority of the ground-force element of the Australian contribution to the 2003 invasion of Iraq, known as Operation Falconer, moving in quickly and successfully, thus enhancing Australia's standing amongst its allies. The Australian Special Forces Task Group was built around 1 Squadron, with a platoon from the 4 RAR (Commando) and a troop from the IRR available to support the SASR. 1 Squadron operated in western Iraq where it was successful in securing its area of operations. Elements of the SAS Squadron crossed the Iraqi border on the night of 19 March by vehicle, penetrating 30 kilometres (19 mi) before being engaged in one of the first actions of the war. Other patrols were inserted by helicopter more 600 kilometres (370 mi) from their staging areas and subsequently fought a number of actions over the following month. Australian patrols were the closest coalition elements to Baghdad for a number of days, observing key roads and facilities. Towards the conclusion of the 42-day campaign the SAS secured the huge but undefended Al Asad air base, approximately 200 kilometres (120 mi) west of Baghdad, capturing more than 50 aircraft. 1 Squadron was withdrawn from Iraq without replacement shortly after the end of the war, and was subsequently awarded a Unit Citation for Gallantry. A SASR Long Range Patrol Vehicle-mounted patrol in Iraq in 2003. Yet some members of the SASR continued to operate in Iraq over the next few years in a number of roles. In 2004 claims appeared in the media that Australian special forces were involved in counter-insurgency operations inside Iraq, although this was denied by the government. An SASR team was deployed to Iraq in May and June 2005 as part the effort to free Douglas Wood, an Australian engineer kidnapped in Baghdad; however, he was later recovered alive by US and Iraqi forces. In 2007, British media reports suggested that SASR elements were still operating in Iraq, along the southern border with Iran, targeting arms smugglers. Later, a small number of SASR personnel were deployed to Iraq in June 2014 to protect the Australian embassy when the security of Baghdad was threatened by the 2014 Northern Iraq offensive, while others were reported to have been tasked with providing security to Royal Australian Air Force aircrew aboard transport aircraft delivering arms and munitions to forces in Kurdish-controlled northern Iraq during September 2014. An SASR troop was deployed to Timor Leste in May 2006 as part of Operation Astute, operating alongside a Commando Company Group as part of the Special Forces Component following renewed unrest there. On 4 March 2007, along with the commandos, SASR personnel took part in the Battle of Same during which five rebels were killed during an unsuccessful attempt to apprehend the rebel leader, Alfredo Reinado. It was reported in October 2006 that 20 SASR operators were in the southern Philippines, supporting Filipino operations against the Abu Sayyaf and Jemaah Islamiah terrorist groups, but this was denied by the Department of Defence. Meanwhile, following tensions in Fiji between the military and the government the Australian Government dispatched three naval vessels in November and December 2006 as part of Operation Quickstep, in preparation for a potential evacuation of Australian citizens. On 29 November 2006, a Black Hawk helicopter from the 171st Aviation Squadron carrying four crew and six soldiers from the SASR crashed while attempting to land on HMAS Kanimbla and sank in international waters off Fiji. The helicopter's pilot and a soldier from SASR were killed in the crash. In March 2012, the Sydney Morning Herald reported that the fourth sabre squadron had been reraised in 2005 and that for many years it had been carrying out special recovery planning, gathering intelligence in Africa, specifically Zimbabwe, Nigeria and Kenya, to develop plans in case Australian civilians needed to be rescued from a hostile environment. The Squadron was reported to be working closely with the Swan Island based ASIS. Concerns within the SASR were reported that they would not be afforded legal protection the same as ASIS operatives if exposed and that there was no contingencies plans if they were detained. Professor Hugh White from the Australian National University was quoted as saying that, as soldiers, they would not have the legal cover ASIS would have if caught. The newspaper also reported that the then Minister for Foreign Affairs Kevin Rudd had argued for squadron to be used in Libya during the civil war, but was overruled by the Minister for Defence, Stephen Smith, and the Chief of the Defence Force, General David Hurley. The operations were not confirmed by the Minister for Defence. While, Kevin Rudd said the Libya claims were a "total, absolute, fabrication". Each sabre squadron is approximately 90-strong, and is divided into three troops (Water Troop, Free-Fall Troop and Land Troop). A troop comprises four patrols with five or six operators in each patrol, and is commanded by a captain with each patrol commanded by a sergeant. For surveillance operations the SASR usually operates in patrols; however, for CT operations it usually employs larger force elements. Support personnel include signallers, mechanics and technicians, medical staff, storemen, drivers, caterers and various specialists. It was reported in 2012 that six female soldiers were being trained in the United States. As of 2003, 152 Signal Squadron comprised four troops. Military dogs, designated Special Operations Military Working Dog (SOMWD), have been members of the SASR since 2005, seeing service in Afghanistan and have their own memorial. While the SASR is a regular army unit, it also has a pool of Army Reserve personnel. These soldiers are former regular Army members of the SASR or specialists. The standard dress of the regiment is the new Multicam-design camouflage which became standard issue to special forces troops in 2012, and is now being introduced to all other Australian Army soldiers in Afghanistan and will eventually become the standard Operational Combat Uniform (OCU). Although SASR parade, working and field uniforms are generally the same as those used by the rest of the Australian Army, special uniforms—including black coveralls—are used depending on the tactical situation. Qualified SASR members wear a sandy-coloured beret with a metal, gold and silver badge, depicting the sword Excalibur, with flames issuing upwards from below the hilt, with a scroll across the front of blade inscribed with the regimental motto "Who Dares Wins", on a black shield. [Note 4] This differs from the British Special Air Service, which wears a woven cloth cap badge of the same design. SAS 'Ibis'-style parachute wings (rounded at the bottom and straight on top) are worn on the right shoulder on general duty, ceremonial and mess dress uniforms only. A garter blue lanyard is worn. Members of the regiment often dispense with rank, use first names, and wear long hair and beards on operations or when in the field. Soldiers are armed with a variety of weapons systems depending on what the mission dictates. These include the M4A1 carbine (designated as the M4A5 in Australia), which is used as their primary weapon. The shortened version of the M4, known as the Mk 18 CQBR, is also used. The Heckler and Koch MP5 submachine gun is used in the counter-terrorist role. Primary weapons are complemented with the two issued sidearms, the USP Tactical and the Glock 19. For medium to long range engagements the Heckler & Koch HK417, SR-25 marksman rifle, and Mk 14 Enhanced Battle Rifle are also used. Support weapons used include the Mk48 Maximi Modular, MAG 58 and the Para Minimi. Sniper rifles used have included the SR-98, Blaser Tactical 2, and Barrett M82A2. The regiment also uses a number of direct and indirect fire support weapons including 66 mm M72 rockets, 84 mm M3 MAAWS, FGM-148 Javelins, M2-QCB Browning .50 calibre machine guns, Mk 19 grenade launchers, and mortars. [Note 5] Flash bang devices and fragmentation grenades are also used depending on the tactical situation, including the thermobaric Mk 14 Anti-Structure Munition (ASM-HG) which has reportedly been used in Afghanistan. A range of different vehicles are used, including the Supacat High Mobility Transporter (HMT) Extenda with 31 purchased in 2007 designated the Special Operations Vehicle – Special Reconnaissance (SOV-SR), named "Nary" after a SASR warrant officer killed during pre-deployment training in 2005. The first Nary was delivered in 2008 but due to technical problems the vehicles did not enter service until 2011, replacing the Long Range Patrol Vehicle (LRPV) which had seen extensive service in Afghanistan and Iraq. New SOV-Logistics trucks are being acquired to replace the Mercedes-Benz Unimog for supply, support and recovery of the SOV-SR. A lighter, less protected vehicle, more akin to the LRPV—the Polaris Defense DAGOR (Deployable Advanced Ground Off-road)—was being trialled in 2015. Motorcycles are also used for long range strategic reconnaissance seeing service in Afghanistan. Polaris six-wheel all-terrain vehicles are also used, seeing service in Afghanistan. Heavily modified up-armoured Toyota Land Cruiser four wheel drive vehicles designated SOV-Support are used for domestic counter-terrorism and special recovery. The SASR regiment has high personnel standards, and selection into the regiment is considered the most demanding of any entry test in the Australian Army. Members of the SASR are required to work in small teams for extended periods and often without support, and are specially selected for their ability to work in this environment, rather than as individuals. Selection is open to all serving Australian Defence Force personnel. Candidates must complete the Special Force Screen Test at the Special Forces Training Centre, which tests their physical fitness, and also includes an interview. About 64 percent of applicants pass this test. Successful candidates then continue on to the 21-day SAS Selection Course which assesses both the individual's strength and endurance (mental and physical), as well as overall fitness, ability to remain calm in combat, and to work effectively in small teams. The course consists of four phases with the first two mainly of physical and navigational exercises held at the Bindoon Training Centre. The third and fourth phases are conducted in the Stirling Ranges with long pack marches in phase three and small group exercises in phase four with little or no sleep and food. Around 10 to 30 percent of candidates pass selection. These candidates then progress onto the 16 month reinforcement cycle, during which they will complete a range of courses including weapons, basic patrolling, parachuting, combat survival, signaller / medic, heavy weapons, demolitions, method of entry, and urban combat before posting to a sabre squadron if successful and awarded their Sandy beret. Officers must complete additional courses to qualify as an officer in the regiment, with requisite expertise in operations, administration and command. Most candidates are generally in their late-20s and are on average older than most soldiers. In 2010, a two-hour documentary SAS: The Search for Warriors was produced on the selection course. Earlier in 1985, the documentary Battle for the Golden Road, had also been produced on the course. All members of the SASR are parachute qualified, and each member of a patrol has at least one specialisation, including medic, signaller, explosive expert or linguist. Counter terrorist training includes close quarters battle (CQB), explosive entry, tubular assault (in vehicles such as in buses, trains and aircraft) and in high rise buildings, as well as room and building clearance. This training is conducted in a range of advanced facilities, including electronic indoor and outdoor CQB ranges, outdoor sniper range, and urban training facilities at Swanbourne. Additional facilities include a special urban complex, vertical plunging range, method of entry house, and simulated oil rig and aircraft mock-ups in order to provide realistic training environments for potential operational scenarios. SASR personnel also provide training in weapons handling to ASIS operatives at Swan Island in Victoria. Despite a possible reduction in rank, SASR operators receive significant allowances, which make them among the highest-paid soldiers in the Australian Defence Force, with a trooper (equivalent to a private) reportedly earning about $100,000 per annum in 2006. The SASR maintains close links with special forces from the United States, United Kingdom, New Zealand and Canada, regularly participating in joint exercises and individual personnel exchange programs with the British SAS and SBS, as well as the New Zealand SAS, US Navy SEALs and United States Special Forces. The regiment also regularly conducts exercises with and trains soldiers from South East Asian nations, and participates in exercises with regional special forces. From 1992 this has included close links with the Indonesian Kopassus, a relationship which has at times been politically controversial. Since its formation the SASR has lost more men in training than in combat, due to the nature of the training regime. In 2014, the regiment celebrated its 50th anniversary. During this period 48 soldiers have been killed during operations or in training accidents, while another 20 died in "other circumstances". More than 200 have been wounded. The names of those killed are recorded on a plaque on a memorial made of a large piece of granite outside the SASR headquarters at Campbell Barracks, known as "The Rock". ↑ 3 Squadron made an operational parachute jump 5 kilometres (3.1 mi) north west of Xuyen Moc on 15–16 December 1969, codenamed Operation Stirling. ↑ The SASR was reported to have subsequently been involved in intelligence gathering tasks prior to the landings according to some sources; however, others have stated that there was no special forces involvement in the covert intelligence gathering undertaken during this period. ↑ Commanded by CO 4 RAR (Cdo), the operation involved members of TAG (West), TAG (East) and the Incident Response Regiment. ↑ The sandy-beret was adopted by the regiment in 1965, while prior to this the maroon airborne forces beret and badge of the Royal Australian Regiment was worn. ↑ The Mk 19 grenade launcher is currently being replaced by the Mk 47 Light-Weight Automatic Grenade Launcher. ↑ The SASR's alliance with the British SAS was approved in 1960 and reconfirmed in 1967, while an alliance with the Parachute Regiment was also approved in 1968. The alliance with the Parachute Regiment no longer appears to be maintained, with that regiment now allied with the 8th/9th Battalion, Royal Australian Regiment. ↑ Lee 2007, p. 30. 1 2 "SAS: Combat Fatigue". Background Briefing. ABC Radio National. 9 March 2003. Archived from the original on 27 February 2009. Retrieved 24 August 2010. 1 2 Jobson 2009, p. 133. 1 2 3 Festberg 1972, p. 25. ↑ "MUC – SASR". It's an Honour. Australian Government. 19 December 2002. Retrieved 7 June 2010. ↑ McPhedran 2005, p. 338. 1 2 "Special Air Service Regiment". Who We Are: Divisions and Brigades – Special Operations Command. Australian Army. Retrieved 11 May 2014. 1 2 3 4 5 6 Horner 2001, p. 197. ↑ Kuring 2004, p. 432. 1 2 3 4 5 Miller 2003, p. 13. 1 2 3 Micheletti 2003, p. 133. 1 2 Dennis et al 2008, p. 507. ↑ Brigadier Mike Hannan (21 November 2002). "Media Briefing Australia's Commitment to the International Coalition Against Terrorism (MECC 668/02)" (Press release). Department of Defence. 1 2 Hill, Robert (25 May 2004). "Australia's Response to Terrorism". Department of Defence. Archived from the original on 15 March 2011. Retrieved 10 May 2014. 1 2 Miller 2003, p. 12. 1 2 Horner 2002, p. 429. ↑ Kuring 2004, p. 433. ↑ Blaxland 2014, p. 175. ↑ Horner 2002, pp. 19–35. ↑ Horner 2002, p. 27. 1 2 3 4 Lord & Tennant 2000, p. 23. ↑ Horner 2002, pp. 36–40. ↑ Shortt & McBride 1981, p. 22. ↑ Dennis et al 2008, p. 506. ↑ Horner 2002, p. 70. ↑ Horner 2002, p. 140. ↑ Horner 2002, pp. 78–83. ↑ Horner & Thomas 2009, pp. 46–82. ↑ Horner & Thomas 2009, pp. 68–71. ↑ "1st Squadron, Special Air Service Regiment". Confrontation, 1963–1966 (Indonesia, Malaysia, Borneo) units. Australian War Memorial. Archived from the original on 18 July 2013. Retrieved 16 May 2014. ↑ Dennis & Grey 1996, p. 307. ↑ Horner 2002, p. 158. ↑ "2nd Squadron, Special Air Service Regiment". Confrontation, 1963–1966 (Indonesia, Malaysia, Borneo) units. Australian War Memorial. Archived from the original on 23 October 2013. Retrieved 16 May 2014. ↑ Horner 1989, pp. 60–169. ↑ Dennis et al 2008, p. 154. ↑ "1st Squadron, Special Air Service Regiment". Vietnam War, 1962–1972 units. Australian War Memorial. Archived from the original on 3 February 2014. Retrieved 3 May 2014. ↑ "2nd Squadron, Special Air Service Regiment". Vietnam War, 1962–1972 units. Australian War Memorial. Archived from the original on 3 May 2014. Retrieved 3 May 2014. ↑ "3rd Squadron, Special Air Service Regiment". Vietnam War, 1962–1972 units. Australian War Memorial. Archived from the original on 3 May 2014. Retrieved 3 May 2014. 1 2 Kuring 2004, p. 348. ↑ Stephens 2001, pp. 265–268. ↑ Anderson 2002, p. 131. 1 2 Horner 2002, pp. 343–344. ↑ Horner 2002, pp. 140 and 227. ↑ Crosby 2009, p. 195. 1 2 Lord & Tennant 2000, p. 24. ↑ Horner 2002, p. 234. 1 2 3 4 5 6 Walters 2006, p. 11. ↑ Horner 2002, pp. 390–391. ↑ Nicholson 2008, p. 5. ↑ Horner 2002, p. 399. ↑ Horner 2002, p. 393. ↑ Horner 2002, pp. 415–417. ↑ Horner 2002, pp. 413–414. ↑ Horner 2002, p. 417. ↑ Horner 2002, p. 423. ↑ Horner & Thomas 2009, p. 286. ↑ Horner 2002, p. 453. ↑ Horner 1992, p. 175. 1 2 3 Horner 2002, p. 455. ↑ Horner & Connor 2014, pp. 485–499. ↑ Horner 2002, p. 456. ↑ Horner & Connor 2014, p. 367. ↑ Horner 2002, pp. 456–462. ↑ Horner 2002, p. 463. ↑ Wright 2003, p. 25. ↑ Jackson, Liz (Reporter); Janine Cohen (Producer); Jacquelyn Hole (Researcher) (24 March 1997). Where Does the Buck Stop?. Four Corners (Television production). Australian Broadcasting Corporation. Retrieved 20 August 2016. ↑ McLucas 2003, p. 43. ↑ Horner 2002, p. 468. ↑ Horner 2002, pp. 468–469. 1 2 Horner 2002, p. 474. ↑ Horner & Connor 2014, pp. 254–258. ↑ Horner 2002, pp. 474–477. ↑ Horner 2002, p. 483. ↑ "Special Air Service Regiment". Australian Military Units. Australian War Memorial. Archived from the original on 23 October 2013. Retrieved 24 May 2014. ↑ Horner 2002, pp. 483–489. 1 2 Lord & Tennant 2000, pp. 24–25. ↑ Horner 2002, pp. 492–493. ↑ Horner 2002, p. 490. ↑ Coulthard-Clark 2001, pp. 295–296. 1 2 Farrell 2000, p. 27. ↑ Horner 2002, p. 509. ↑ Farrell 2000, p. 41. ↑ Williams, Emma. "AUSCDT4 Clears Beaches and Conducts Clandestine Ops in East Timor". Royal Australian Navy. Archived from the original on 28 April 2001. 1 2 Lord & Tennant 2000, p. 25. ↑ "MUC – 3SQN SASR". It's an Honour. Australian Government. 25 March 2000. Retrieved 7 June 2010. 1 2 Senator Robert Hill, Minister of Defence (9 June 2004). "Special Forces receive Iraq Honours (MIN108/04)" (Press release). Department of Defence. Archived from the original on 7 September 2004. Retrieved 16 November 2016. ↑ Horner 2002, pp. 510–511. ↑ Horner 2002, pp. 513–514. ↑ Head 2009, pp. 11–12. ↑ McPhedran 2005, p. 122. ↑ McPhedran 2005, p. 139. ↑ McPhedran 2005, pp. 118 and 122. ↑ Mickelburough 2003, p. 1. ↑ Blaxland 2014, p. 287. ↑ McPhedran 2005, pp. 145–152. ↑ Horner & Thomas 2009, pp. x–xi. ↑ McPhedran 2005, pp. 153–158. ↑ McPhedran 2005, pp. 181–182. ↑ Neville 2008, p. 30. ↑ McPhedran 2005, pp. 196. ↑ McPhedran 2005, p. 202. ↑ McPhedran 2005, pp. 196–202. ↑ Callinan 2002, p. 9. ↑ Pugliese 2003, p. 92. ↑ Horner & Thomas 2009, p. xi. ↑ Neville 2008, pp. 29–30. 1 2 Horner 2008, p. 337. 1 2 Dennis et al 2008, p. 9. ↑ Air Chief Marshal Angus Houston, Chief of Defence Force; Major General Michael Hindmarsh (27 September 2006). "SOCAUST Media Briefing Post OP Slipper Transcript (MECC 60927/06)" (Press release). Department of Defence. ↑ Horner 2008, p. 338. ↑ "Australia to double Afghan force". bbc.co.uk. 10 April 2007. Retrieved 12 April 2007. ↑ "Global Operations – Department of Defence". Australian Department of Defence. Archived from the original on 10 April 2009. Retrieved 15 April 2009. ↑ "More Troops for Afghanistan". Prime Minister of Australia (Press release). Australian Government. 10 April 2007. Archived from the original on 20 April 2007. Retrieved 11 May 2014. ↑ Neville 2011, p. 22. ↑ Major General Tim McOwan, Special Operations Commander (11 December 2008). "Update on Special Operations in Afghanistan (MECC 81211/08)" (Press release). Department of Defence. ↑ Middleton 2011, p. 220. ↑ "Special Operations Units Awarded Battle Honour" (Press release). Department of the Prime Minister and Cabinet. 26 March 2013. Archived from the original on 13 April 2013. Retrieved 26 March 2013. ↑ "Unit Citations". Official Australian Special Air Service Historical Foundation. SAS Historical Foundation. 2013. Retrieved 19 February 2015. ↑ Lee, Wroe & Darby 2015. ↑ McPhedran 2013, p. 1. ↑ "Battle casualties in Afghanistan". Global Operations: Afghanistan. Department of Defence. Retrieved 27 May 2014. ↑ Sheridan 2007, p. 19. ↑ McPhedran 2005, pp. 250–325. ↑ Horner & Thomas 2009, pp. xi–xii. ↑ Department of Defence 2004, pp. 21–26. 1 2 Horner & Thomas 2009, p. xii. ↑ "Financial Review Wrong on Special Forces Allegations" (Press release). Department of Defence. 28 August 2004. Archived from the original on 4 August 2014. Retrieved 22 November 2014. ↑ Maylor & Macklin 2010, p. 186–192. ↑ "Australian Special Forces in Iraq". Nautilus Institute. 2013. Retrieved 9 March 2014. ↑ Brissenden, Michael (3 July 2014). "Australia scales back embassy staff numbers in Iraq due to safety fears over safety of Baghdad airport". ABC News. Australian Broadcasting Corporation. Retrieved 3 July 2014. ↑ "ADF delivers fourth arms shipment to Iraq" (Press release). Department of Defence. 17 September 2014. Retrieved 17 September 2014. ↑ Farrell 2006, p. 34. ↑ Blaxland 2014, p. 201. ↑ Australian & NZ Defender Magazine 2007, pp. 22–26. ↑ Sheridan 2006, p. 22. ↑ "No ADF Operations in the Philippines" (Press release). Department of Defence. 14 October 2006. Archived from the original on 25 June 2015. Retrieved 11 May 2014. ↑ Blaxland 2014, p. 314. ↑ "Report of the Board of Inquiry into the Crash of Black Hawk 221 Released" (Press release). Department of Defence. 15 July 2008. ↑ Army: The Soldier's Newspaper 2006. 1 2 3 4 5 6 7 Epstein & Welch 2012, p. 1. ↑ "Inquiry into recogition of Australian Defence Force Service for Special Air Service Counter Terrorist and Special Recovery Duties" (PDF). Defence Honours & Awards Tribunal. Australian Government: 12. 22 December 2009. Retrieved 16 August 2016. ↑ Griffiths & Bourke 2012. 1 2 3 4 5 "Campbell Barracks redevelopment project, Swanbourne, Western Australia" (PDF). Parlimentary Standing Committe On Public Works. By Authority of the House of Representatives. Perth: Commonwealth of Australia. Official Committee Hansard. 6 August 2015. ↑ Horner 2002, p. 198. ↑ "Jane's Amphibious and Special Forces – Australia Special Forces (Land)". 22 April 2014. Retrieved 15 May 2014. ↑ Lee 2007, p. 95. ↑ Horner 2002, pp. 402–403. ↑ Horner 2002, p. 486. ↑ The Honorable Fran Bailey, MP Parliamentary Secretary to the Minister of Defence (13 May 2003). "More Than $14 Million Defence Funding for Western Australia in 2003–04 Budget" (Press release). Department of Defence. Retrieved 12 June 2014. ↑ Army: The Soldier's Newspaper 2015, p. 23. ↑ "Two brave best friends will be missed". Defence News. 28 August 2012. Retrieved 18 May 2016. ↑ Army: The Soldier's Newspaper 2013, p. 4. ↑ Australian Army 2014, p. 37. ↑ "New Combat Uniform Makes Troops Job Easier". Defence News. Department of Defence. 19 November 2010. Retrieved 11 May 2014. 1 2 Horner 2002, p. 134. 1 2 Kuring 2004, p. 260. ↑ Lord & Tennant 2000, p. 8. ↑ Davis 1983, p. 67. ↑ Jobson 2009, pp. 182 and 186. ↑ Jobson 2009, p. 199. ↑ Masters 2012, p. 3. ↑ Australian Defence Magazine 2009. ↑ "MP5 9 millimetre". Australian Army. Retrieved 28 September 2016. ↑ Neville 2016, p. 63 and 74. 1 2 Fennell 2009, p. 137. ↑ Farrell 2011, p. 9. 1 2 Farrell 2011, p. 8. 1 2 McPhedran 2007, p. 173. ↑ "F89 and Para Minimi". Our Work: Equipment and Clothing – Small Arms. Australian Army. Retrieved 11 May 2014. ↑ Davis 2013, p. 11. ↑ Foster 2016, p. 5. ↑ Neville 2016, pp. 223–240. ↑ Lieutenant General Peter Leahy, Chief of Army (12 November 2006). "New Special Operations Vehicle named in honour of SASR Warrant Officer (MECC295/06)" (Press release). Department of Defence. 1 2 Slocombe 2012, pp. 10–12. ↑ The Honorable Joel Fitzgibbon, Minister for Defence (27 October 2008). "New Special Operations Vehicles delivered (MIN145/08)" (Press release). Department of Defence. ↑ Department of Defence 2012, p. 153. 1 2 Muir 2008, pp. 46–48. ↑ Australian & NZ Defender Magazine 2015, p. 53. ↑ Walker 2003, p. 7. ↑ Pugliese 2003, p. 84. ↑ Kendrick 2015, p. 5. ↑ Dodd 2007, p. 21. ↑ Army: The Soldier's Newspaper 2011, p. 23. 1 2 3 MacKenzie 2006. 1 2 3 4 5 Heyer & Platz 2010, pp. 18–19. ↑ McPhedran 2005, pp. 17–18. ↑ "SAS: The Search for Warriors". Screen Australia. Retrieved 19 August 2016. ↑ "SAS Australia [videorecording]: battle for the golden road / Guy Baskin. 1985, English, Video edition". National Library of Australia. Retrieved 20 August 2016. ↑ Boer 2008, p. 3. ↑ Horner 2001, pp. 198–199. ↑ Nicholson 2007, p. 2. ↑ "SASR Pays Tribute To Barracks' Namesake". Australian Army. 2014. Retrieved 3 May 2014. ↑ McPhedran 2005, p. 192. ↑ Mills, T.F. 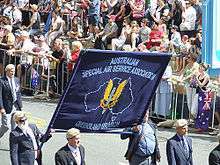 "Australian Special Air Service Regiment". Regiments.org. Archived from the original on 24 September 2006. Retrieved 24 January 2007. ↑ Chant 2013, p. 246. "CQB weapon sought for Oz Special Forces". Australian Defence Magazine. Sydney: Yaffa Publishing Group. 4 August 2009. ISSN 1324-6550. Retrieved 10 May 2014. "Two of our best lost in tragedy". Army: The Soldiers' Newspaper (1158 ed.). Canberra: Department of Defence. 14 December 2006. ISSN 0729-5685. "Screen test for SF" (PDF). Army: The Soldier's Newspaper (1235 ed.). Canberra: Department of Defence. 3 March 2011. p. 23. ISSN 0729-5685. Retrieved 19 August 2016. "Recognising man's bravest friend". Army: The Soldiers' Newspaper (1308 ed.). Canberra: Department of Defence. 4 July 2013. p. 4. ISSN 0729-5685. "First of its kind: SASR runs inaugural K9 Symposium in Perth". Army: The Soldiers' Newspaper (1348 ed.). Canberra: Department of Defence. 9 April 2015. p. 23. ISSN 0729-5685. "SOCOMD Rough Terrain Vehicles". Australian & NZ Defender Magazine. Brisbane Market: Fullbore Magazines. Summer (92): 53. 2015. ISSN 1322-039X. "The Australian Army: An Aide-Memoire" (PDF). Australian Army. 2014. Retrieved 17 November 2015. "The War in Iraq. ADF Operations in the Middle East in 2003" (PDF). Canberra, Australian Capital Territory: Department of Defence. 2004. OCLC 62536284. Retrieved 11 May 2014. "Timor: Anzac Battle Group". Australian & NZ Defender Magazine. Brisbane Market: Fullbore Magazines. Winter (58): 22–26. 2007. ISSN 1322-039X. AAP (23 January 2010). "SAS Digger Awarded VC For Taking On Taliban". The Sydney Morning Herald. Sydney: Fairfax Media. ISSN 0312-6315. Retrieved 23 January 2011. Anderson, Paul (2002). When the Scorpion Stings: The History of the 3rd Cavalry Regiment, Vietnam, 1965–1972. Crows Nest, New South Wales: Allen & Unwin. ISBN 1-86508-743-2. Boer, Corinne (21 August 2008). "High level of treatment" (PDF). Army: The Soldiers' Newspaper (1196 ed.). Canberra: Department of Defence. p. 3. ISSN 0729-5685. Retrieved 10 July 2016. Blaxland, John (2014). The Australian Army from Whitlam to Howard. Port Melbourne: Cambridge University Press. ISBN 9781107043657. Bourke, Emily (13 March 2012). "Minister denies secret SAS squads operating illegally". The World Today. Australian Broadcasting Corporation. Retrieved 14 August 2016. Brissenden, Michael (29 October 2014). "Charges being considered against SAS soldier for mutilating corpse". AM. Australian Broadcasting Corporation. Retrieved 30 October 2014. Butterly, Nick (15 June 2011). "Rifle is a dud, says SAS veteran". The West Australian. Perth: Seven West Media. ISSN 0312-6323. Callinan, Rory (16 March 2002). "SAS Destroys Taliban Anti-Aircraft Menace". The Courier Mail. Brisbane, Queensland: News Limited. p. 9. ISSN 1833-5772. Callinan, Rory (31 May 2005). "Phantoms of the Mountains". Time Magazine. ISSN 0040-781X. Retrieved 24 April 2013. Chant, Christopher (2013) . Handbook of British Regiments. London: Routledge. ISBN 9781134647248. Connors, Shaun (9 April 2014). "Briefing: Wheels of the Elite" (PDF). Jane's Defence Weekly. 51 (20). ISSN 0265-3818. Coulthard-Clark, Chris (2001). Where Australians Fought: The Encyclopaedia of Australia's Battles (Second ed.). Crows Nest, New South Wales: Allen & Unwin. ISBN 1-86508-634-7. Crosby, Ron (2009). NZSAS: The First Fifty Years. Auckland: Viking. ISBN 978-0-67-007424-2. Daley, Paul (29 August 2000). "Terms of Engagement". The Age. Melbourne: Fairfax Media. ISSN 0312-6307. Davis, Brian Leigh (1983). British Army Uniforms and Insignia of World War Two. London: Arms and Armour Press. ISBN 0-85368-609-2. Davis, Mick (5 December 2013). "Snipers Hit the Mark: Snipers get fired up at SASR concentration in WA". Army: The Soldiers' Newspaper. Canberra: Directorate of Defence News. p. 11. ISSN 0729-5685. Dennis, Peter; Grey, Jeffrey (1996). Emergency and Confrontation: Australian Military Operations in Malaya and Borneo 1950–1966. The Official History of Australia's Involvement in Southeast Asian Conflicts 1948–1975. St Leonards: Allen & Unwin. ISBN 1-86373-302-7. Department of Defence (2012). "Part Two Department of Defence Annual Report 2011–2012 Defence Material Organisation" (PDF). Canberra: Australian Government Publishing Service. ISSN 1323-5036. Dodd, Mark (22 September 2007). "Our Smoothest Operators". Weekend Australian. Canberra: News Limited. p. 21. ISSN 1038-8761. Epstein, Rafael; Welch, Dylan (13 March 2012). "Secret SAS Teams Hunt For Terrorists". The Sydney Morning Herald. Sydney: Fairfax Media. p. 1. ISSN 0312-6315. Farrell, John (2000). Peace Makers: INTERFETs Liberation of East Timor. Rocklea, Queensland: Fullbore. ISBN 0-646-39424-X. Farrell, John Hunter (2006). "Dili Madness: The ANZAC Intervention in Timor Leste". Australian & NZ Defender Magazine. Brisbane Market: Fullbore Magazines. Spring (55): 34. ISSN 1322-039X. Farrell, John Hunter (2011). "New Weapons and Equipment". Australian & NZ Defender Magazine. Brisbane Market: Fullbore Magazines. Summer (76): 8–9. ISSN 1322-039X. Fennell, Keith (2009). Warrior Training: The Making of an Australian SAS Soldier. North Sydney, New South Wales: Random House Australia. ISBN 9781742750149. Foster, Duncan (20 October 2016). "Light-weight Lethality: Grenade Launcher Trials are Positive". Army: The Soldiers' Newspaper (1384 ed.). Canberra: Department of Defence. p. 5. ISSN 0729-5685. Griffiths, Emma; Bourke, Emily (14 March 2012). "Smith Tight-lipped on SAS Africa Claims". ABC News. Australian Broadcasting Corporation. Retrieved 9 June 2014. Heyer, Simone; Platz, Jess (30 September 2010). "Quest to be the best" (PDF) (1245 ed.). Canberra: Department of Defence. pp. 18–19. ISSN 0729-5685. Retrieved 19 August 2016. Head, Michael (2009). Calling Out the Troops: The Australian Military and Civil Unrest: The Legal and Constitutional Issues. Annandale, New South Wales: Federation Press. ISBN 9781862877092. Horner, David (1989). SAS: Phantoms of the Jungle. A History of the Australian Special Air Service (First ed.). North Sydney, New South Wales: Allen & Unwin. ISBN 1-86373-007-9. Horner, David (1992). The Gulf Commitment: The Australian Defence Force's First War. Carlton, Victoria: Melbourne University Press. ISBN 9780522845112. Horner, David (2001). Making the Australian Defence Force. The Australian Centenary History of Defence. Volume IV. Melbourne, Victoria: Oxford University Press. ISBN 0-19-554117-0. Horner, David (2002). SAS: Phantoms of War. A History of the Australian Special Air Service (Second ed.). Sydney, New South Wales: Allen & Unwin. ISBN 1-86508-647-9. Horner, David, ed. (2008). Duty First: A History of the Royal Australian Regiment (Second ed.). Crows Nest: Allen & Unwin. ISBN 978-1-74175-374-5. Horner, David; Thomas, Neil (2009). In Action With the SAS (Third ed.). Crows Nest, New South Wales: Allen & Unwin. ISBN 9781741755527. Horner, David; Connor, John (2014). The Good International Citizen: Australian Peacekeeping in Asia, Africa and Europe, 1991–1993. The Official History of Australian Peacekeeping, Humanitarian and Post-Cold War Operations. Port Melbourne, Victoria: Cambridge University Press. ISBN 978-1-107-02162-4. Horsfield, Bruce (2000). "Communication and the Postmodern Organisation: A Report of Qualitative Research on the Australian Special Air Service Regiment". The Electronic Journal of Communication. Communication Institute for Online Scholarship. 10 (1 and 2). ISSN 0021-9916. Archived from the original on 22 October 2013. Retrieved 17 May 2014. Kendrick, Anna-Maria (23 April 2015). "Tactical mobility boost for troops". Army: The Soldiers' Newspaper (1349 ed.). Canberra: Department of Defence. p. 5. ISSN 0729-5685. Kuring, Ian (2004). Redcoats to Cams: A History of Australian Infantry 1788–2001. Loftus, New South Wales: Australian Military Historical Publications. ISBN 1876439998. Lee, Sandra (2007). 18 Hours: The True Story of an SAS War Hero. Pymble, New South Wales: HarperCollins. ISBN 978-0-73228-246-2. Lee, Jane; Wroe, David; Darby, Andrew (23 August 2015). "Liberal candidate Andrew Hastie says he has been cleared of wrongdoing in Afghan war incident". The Canberra Times. Canberra: Fairfax Media. ISSN 0157-6925. Retrieved 23 August 2015. Lord, Cliff; Tennant, Julian (2000). ANZAC Elite: The Airborne and Special Forces Insignia of Australia and New Zealand. Wellington, New Zealand: IPL Books. ISBN 0-908876-10-6. MacKenzie, Hugh (8 March 2006). "Hard Slog Pays Big Dividends". Army: The Soldiers' Newspaper (1138 ed.). Canberra: Department of Defence. ISSN 0729-5685. Archived from the original on 26 June 2013. Retrieved 24 August 2010. Masters, Chris (2012). Uncommon Soldier: Brave, Compassionate, Tough. The Making of Australia's Modern Day Diggers. Crows Nest, New South Wales: Allen & Unwin. ISBN 978-1-74175-971-6. Maylor, Rob; Macklin, Robert (2010). SAS Sniper: The World of an Elite Australian Marksman. Sydney, New South Wales: Hachette Australia. ISBN 9780733624957. McLucas, Alan C. (2003). "Worst Failure–Failure To Learn About Risks". Decision Making: Risk Management, Systems Thinking and Situation Awareness. Canberra: Argos Press. pp. 43–68. ISBN 978-0-9580238-2-5. McPhedran, Ian (2005). The Amazing SAS: The Inside Story of Australia's Special Forces. Sydney, New South Wales: HarperCollins. ISBN 0-7322-7981-X. McPhedran, Ian (2007). The Amazing SAS: The Inside Story of Australia's Special Forces. Pymble, New South Wales: Harper Collins Publishers. ISBN 978-0-7322-7984-4. McPhedran, Ian (14 March 2012). "The truth about our secret SAS agents". The Advertiser. Adelaide, South Australia: News Corporation. ISSN 1039-4192. Retrieved 18 August 2016. McPhedran, Ian (29 October 2013). "Our Afghan War Ends Not With Victory, Nor Defeat". The Australian. Canberra: News Limited. pp. 1–11. ISSN 1038-8761. Micheletti, Eric (2003). Special Forces: War on Terrorism in Afghanistan 2001–2003. Paris: Histoire & Collections. ISBN 2-913903-90-8. Mickelburough, Peter (21 April 2003). "Ship Seized: Navy, Army Halt Heroin Freighter". Herald Sun. Melbourne: News Limited. p. 1. ISSN 1038-3433. Middleton, Karen (2011). An Unwinnable War: Australia in Afghanistan. Melbourne, Victoria: Melbourne University Press. ISBN 9780522857665. Miller, David (2003). Illustrated Directory of Special Forces. St Paul, Minnesota: Zenith Press. ISBN 9780760314197. Muir, Tony (1 October 2008). "Land Warfare – Vehicles: Special vehicles for Special Operations". Australian Defence Magazine. Sydney: Yaffa Publishing Group: 46–48. ISSN 1324-6550. Neville, Leigh (2008). Special Operations Forces in Afghanistan. Botley, Oxford: Osprey. ISBN 978-1-84603-310-0. Neville, Leigh (2011). Special Operations Patrol Vehicles: Afghanistan and Iraq. New Vanguard. Oxford: Osprey Publishing. ISBN 9781849081870. Neville, Leigh (2016). Guns of Special Forces 2001–2015. Barnsley, South Yorkshire: Pen & Sword. ISBN 9781473881013. Nicholson, Brendan (10 April 2007). "Swan Island: Top Secret Training Area For Agents". The Age. Melbourne: Fairfax Media. p. 2. ISSN 0312-6307. Retrieved 25 May 2014. Nicholson, Brendan (12 September 2008). "Remains Found in Vietnam of Digger Missing in Action for 39 Years". The Age. Melbourne: Fairfax Media. p. 5. ISSN 0312-6307. Retrieved 31 May 2014. Pugliese, David (2003). Shadow Wars: Special Forces in the New Battle Against Terrorism. Ottawa, Ontario: Esprit de Corps Books. ISBN 1-895896-24-X. Sheridan, Greg (14 October 2006). "Behind the Scenes Special Forces Wage War By Stealth". The Weekend Australian. Canberra: News Limited. p. 22. ISSN 1038-8761. Archived from the original on 13 February 2009. Retrieved 11 May 2014. Sheridan, Greg (2007). The Partnership: The Inside Story of the US-Australian Alliance Under Bush and Howard. Sydney, New South Wales: University of New South Wales Press. ISBN 9780868409221. Shortt, James; McBride, Angus (1981). The Special Air Service. London: Osprey Publishing. ISBN 0-85045-396-8. Slocombe, Geoff (November 2012). "Project Redfin – Special Operations Mobility and Information Environment Upgrades". Asia Pacific Defence Reporter. 38 (9): 10–12. ISSN 1446-6880. Smith, Greg (20 November 2003). "Working Outside the Square: Training with the SASR". Army: The Soldiers' Newspaper (1087 ed.). Canberra: Department of Defence. ISSN 0729-5685. Archived from the original on 26 June 2013. Retrieved 10 May 2014. Stephens, Alan (2001). The Royal Australian Air Force. The Australian Centenary History of Defence. Volume II. Melbourne: Oxford University Press. ISBN 0-19-554115-4. Uhlmann, Chris (22 October 2014). "Defence investigating allegation special forces soldier threatened female ASIS agent in Afghanistan with gun". ABC News. Australian Broadcasting Corporation. Retrieved 22 October 2014. Walker, Frank (19 January 2003). "SAS Revved Up For A Fast Ride In Iraqi Desert". The Sun-Herald. Sydney: Fairfax Media. p. 7. ISSN 1323-1987. Retrieved 24 May 2014. Walters, Patrick (6 October 2006). "Unfinished Business". The Australian. Canberra: News Limited. p. 11. ISSN 1038-8761. Retrieved 11 May 2014. Welch, Dylan (30 December 2010). "Army had concerns over Supacat buy". The Age. Melbourne: Fairfax Media. ISSN 0312-6307. Welch, Dylan (13 March 2012). "The Secret Soldiers". The Canberra Times. Canberra: Fairfax Media. ISSN 0157-6925. Wright, Tony (25 February 2003). "Band of Brothers". The Bulletin. Sydney. 121 (6361): 20–26. Bibcode:2010PhTea..48..423K. doi:10.1119/1.3479729. ISSN 1440-7485. Wroe, David (31 August 2014). "SAS to Protect Crews on Arms Drops in Iraq". The Sydney Morning Herald. Sydney: Fairfax Media. ISSN 0312-6315. McKay, Gary (1999). Sleeping With Your Ears Open: On Patrol with the Australian SAS. St Leonards, New South Wales: Allen & Unwin. ISBN 1-86448-978-2. McPhedran, Ian; Ramage, Gary (2014). Afghanistan: Australia's War. South Sydney, New South Wales: Harper Collins Publishers. ISBN 9780732299132. Macklin, Robert (2015). Warrior Elite: Australia's Special Forces – From Z Force and the SAS to the Wars of the Future. Sydney, New South Wales: Hachette Australia. ISBN 9780733632914. Neville, Leigh (2008). Special Operations Forces in Iraq. Botley, Oxford: Osprey. ISBN 978-1-84603-357-5. O'Farrell, Terry (2001). Behind Enemy Lines: An Australian SAS Soldier in Vietnam. Crows Nest, New South Wales: Allen & Unwin. ISBN 1-86508-590-1. Ryan, Mike (2004). Special Operations in Iraq. Barnsley, South Yorkshire: Pen & Sword Military. ISBN 1-84415-032-1. Smith, Greg (7 December 2003). "Adrenalin Anyone? The Truth About SASR Selection". Army: The Soldiers' Newspaper (1088 ed.). Canberra: Department of Defence. ISSN 0729-5685. Archived from the original on 11 November 2012. Retrieved 24 May 2014. Wikimedia Commons has media related to Special Air Service Regiment.